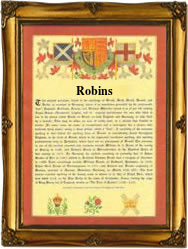 Recorded in several forms including Robin, diminutives Robinet, Robinett, and Robinette, and the more usual patronymics Robins, Robens, Robines, Robbings, Robyns and others, this is an English and French surname. it originates as a diminutive or nickname from the pre 6th century Germanic personal name Hrodebert, the later Robert, and meaning "fame-bright", and recorded in the famous English Domesday Book of 1086. Robin as a personal name was slightly later. It was made popular in England by the 12th century Robin Goodfellow, otherwise known as Puck, whose mischievous tricks are described in Shakespeare's "Midsummer Night's Dream", as well as the famous tales of Robin Hood, who (allegedly) stole from the rich to give to the poor. The surname is first recorded in the latter half of the 13th century with that of Margaret Robines in the Hundred Rolls of Cambridgeshire in 1279. Amongst the recordings of the name in the surving registers of the diocese of Greater London are the marriage of John Robins and Anna Clarcke at the church of St. Martin Orgar, city of London, on January 25th 1544, the marriage of Thomas Robinnett to Cissely Wingfield at St Katherine by the Tower (of London) on July 12th 1616, and the marriage of Allen Robinette to Margaret Symm apparently by civil licence in London, on September 29th 1653. This was during the short "reign" of Oliver Cromwell (1652 - 1658). Surnames became necessary when governments introduced personal taxation. In England this was sometimes known as Poll Tax. Throughout the centuries, surnames in every country have continued to "develop" often leading to astonishing variants of the original spelling.